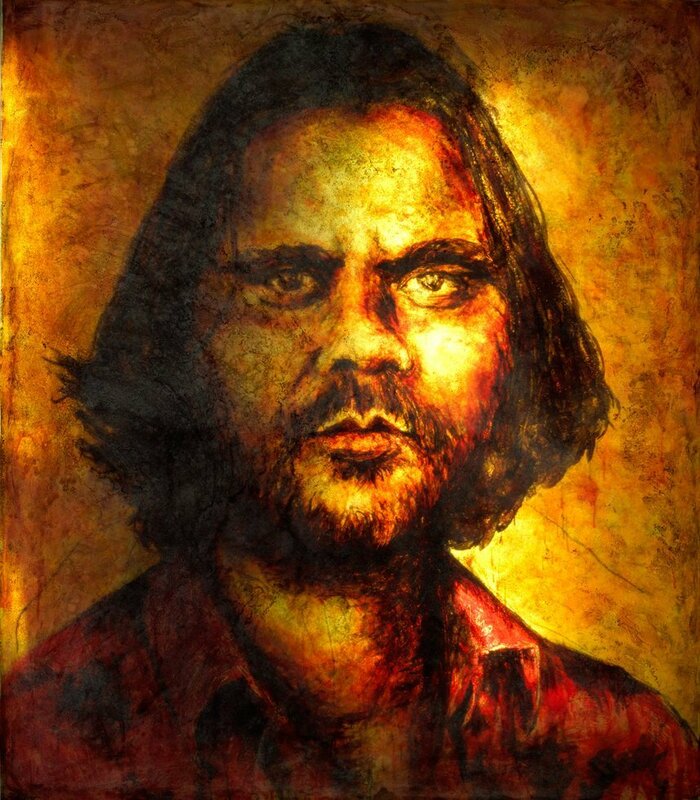 Aboriginal writer/director Warwick Thornton won the Camera d’Or for Best Feature Film at the 2009 Cannes Film Festival for Samson and Delilah . The movie – which was his first feature film – has since won six AFI Awards, including best film and best director, along with numerous other prizes. Thornton has previously made a number of award-winning short films. Craig Ruddy won the 2004 Archibald Prize for his hugely popular but contentious portrait of Aboriginal actor David Gulpilil. The first image that came to mind was a slab of black resin with the hint of a portrait shining through from behind. However, having got to know Thornton, Ruddy felt that such an image would be ‘too heavy to reflect him honestly, as he is a very laid-back and gentle person. A fibreglass light box seemed the obvious choice to accommodate the use of light,’ says Ruddy, who chose a primary palette of predominantly red and yellow to reflect Thornton’s use of colour in Samson and Delilah . The portrait title refers to Thornton’s nickname – given him as he often films using as few lights as possible. ‘He’s unafraid of darkness, for as yin is to yang, dark and light are equal and they travel hand in hand,’ says Ruddy. Born in Sydney in 1968, Ruddy studied design and fashion illustration and worked as a commercial art director before his true passion for drawing and painting emerged in 2001. He now lives and works in Sydney, Buenos Aires and Rio de Janeiro. He has had four solo exhibitions in Sydney and one in London and has been represented in various group shows. This is his third time in the Archibald Prize.